Caramelized onions made with Garlic Balsamic Vinegar are folded into the garlic mashed potatoes threading a mellow sweetness throughout. 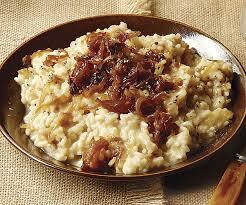 Double-up your caramelized onions to garnish the plate's centre protein, like pork chops, chicken or roast beef. 1) Place potatoes in large pot of cold water, salted water. Bring to a boil and cook until fork tender. 2) While potatoes are cooking melt butter in microwave. Stir in Garlic Mashed Potato Seasoning. Add seasoned butter to cream. Keep warm on stove. 3) Drain potatoes, return to dry pot. Begin to mash, slowly adding in cream mixture. Mix in goats cheese. Add 4 tbsp (approx.) caramelized onion to potatoes and blend in. 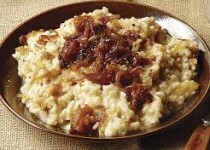 4) Season to taste and serve in bowl with caramelized onion garnish on top.